The Dow is up today thanks to two U.S. economic releases that bode well for the economy and signs that Congress and the president are moving closer to a compromise on the fiscal cliff. As of 1:20 p.m. EST, the Dow Jones Industrial Average is up 101 points, or 0.76%, to 13,336. The S&P 500 is up almost 1%. The current account balance -- the difference between U.S. exports and imports of goods, services, and money -- shrank $10 billion in the third quarter from -$118 billion to -$108 billion. While analysts had expected a deficit of just -$102 billion, a declining U.S. current account deficit is seen as a positive. The second release was the National Association of Home Builders housing market index, which rose two points from November to 47 -- its highest level since April 2006. The reading was above analysts' expectations of of 47. Still, it hasn't quite reached the threshold of 50, which indicates positive conditions. 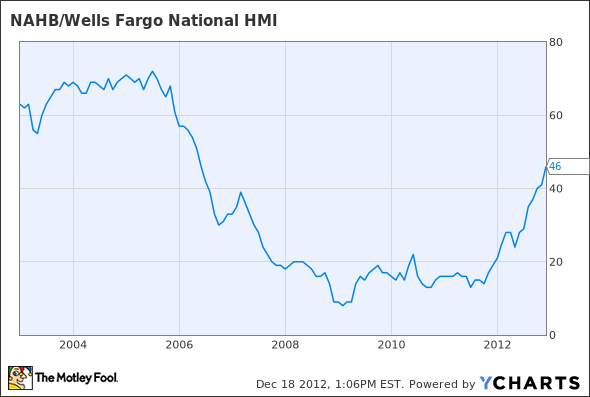 NAHB/Wells Fargo National HMI data by YCharts. In fiscal-cliff news, House Speaker John Boehner called for a plan B in case talks failed. The White House rejected any such measure, as it would rather force Congress to actually come up with a compromise -- not just kick the can down the road. The Motley Fool has created a special page that will be updated with all of our latest fiscal-cliff coverage to help cut through the daily noise and give you the information and analysis you need as an investor. Head on over for everything you need to know about fiscal cliff 2012. Given the positive news about the economy and the fiscal cliff negotiations, it's no surprise that the market is up. Today's Dow leader is Hewlett-Packard , up 2.3%. HP has had a terrible 2012, down 43% year to date. The company has been struggling with poor management for the past few years. A boardroom scandal, two terrible acquisitions, and accusations of fraud against the former CEO of one of its acquisitions have all combined to push the stock down 72% over the past five years. The stock has rallied 13% in the past month as some investors -- supposedly including noted activist Carl Icahn -- begin to see HP as a steal. If you're interested in Hewlett-Packard, the Motley Fool's technology analyst details exactly what investors need to know about HP in our new premium research report. Just click here now to get your copy today, and you'll receive a year of updates as the stock's story unfolds. The article This Stock Is Leading the Dow's Rally originally appeared on Fool.com. Dan Dzombak can be found on Twitter @DanDzombak or on his Facebook page: DanDzombak. He owns no shares in the companies mentioned. The Motley Fool has no positions in the stocks mentioned above. Try any of our Foolish newsletter services free for 30 days. We Fools may not all hold the same opinions, but we all believe that considering a diverse range of insights makes us better investors. The Motley Fool has a disclosure policy.